Walking with Jesus: Day 82: Mark 9:2-29 & Psalm 83 - What Does It Mean to Pray "Help My Unbelief"? Day 82: Mark 9:2-29 & Psalm 83 - What Does It Mean to Pray "Help My Unbelief"? 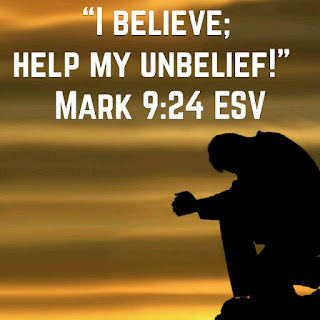 What Does It Mean to Pray "Help My Unbelief"? In today's passage, we have one of the most famous responses to Jesus in all of the Gospels. The father of the demon-possessed boy responds to Jesus by saying, "I believe; help my unbelief!" What does this plea mean and how does Jesus answer it? God is very patient and understanding with us. Psalm 103:14 says, "For he knows our frame; he remembers that we are dust." In fact, the whole reading today emphasizes the patience of Jesus in dealing with weak and dusty sinners. Jesus takes His disciples up on the mountain where He is transfigured before them in the presence of Moses and Elijah to show them who He is and to strengthen their faith in Him. (Read more on this) By giving His closest three disciples a glimpse of His glory, Jesus is giving them insight into His divine nature. By appearing with Moses and Elijah, who represent the Law and the Prophets, Jesus is directing them to the witness of Scripture to further strengthen their faith. Finally, when the disciples were on the verge of missing the real point of the Transfiguration, God the Father speaks Himself from heaven and says, "This is my beloved Son. Listen to Him!" We have this testimony recorded and given to us in the Gospels so that we, too, can benefit from the experience of Peter, James and John. Their experience was not just for themselves, it was to strengthen the faith of all of us who are seeking to trust in Jesus. We have faith. We do believe. But we need help with our unbelief, because we also doubt. This is what the man's response to Jesus was. Jesus told him, "All things are possible for one who believes!" The man wanted his son freed, and he did believe that Jesus was able to help him. Otherwise, he would not have gone to Him and asked Him for help. But he also knew his own heart and his own doubts, which were strong and real. Jesus responds to his plea with compassion and healing. We need God to have compassion on us in our weakness, because we are so weak. We need Jesus to help us with our unbelief, because unbelief rears its ugly head right alongside faith in our frail hearts. Thankfully, God gives us faith and meets us in our need. He gives us reasons to strengthen and substantiate our faith, and then He heals our souls despite our lingering doubts. Let's never hesitate to pray, "I believe; help my unbelief!" 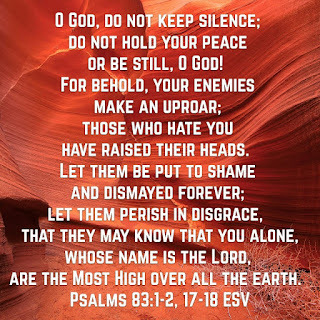 Psalm 83 is an imprecatory Psalm. 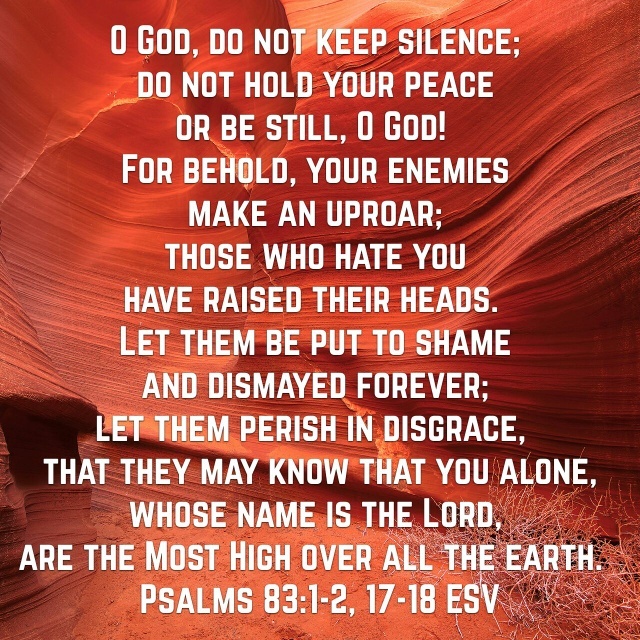 I had some comments on these kinds of psalms in an earlier post on Psalm 58.
to the misguided masses who buy into their propaganda. that Your kingdom and glory and power may be seen in all the earth!